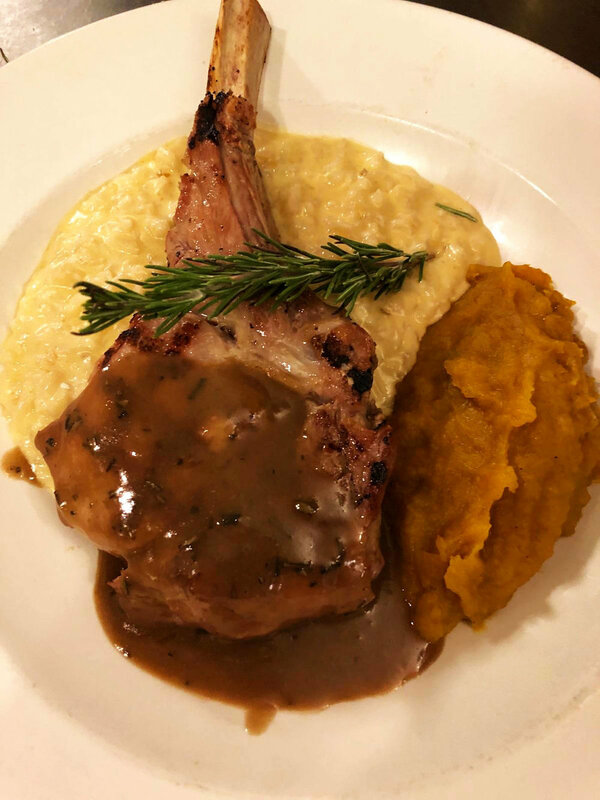 14oz Bone-In Veal Chop, grilled Medium-Rare, topped with Rosemary Marsala Demi-Glace, served with Creamy Parmesan Risotto and choice of vegetable. Grilled Chicken OR Grilled Veal Cutlets tossed with our house-made Lemon-Caper Piccata Sauce & Bowtie Pasta. Butternut Squash, Pumpkin, Sweet Potato and Amaretto filled half-moon shape Raviolis, tossed with steamed Broccoli and Garlic Wine sauce. Ravioli stuffed with Veal, Beef and Parmesan Cheese tossed with sautéed Spinach and Garlic Wine sauce. Grilled Chicken OR Grilled Veal Cutlets tossed with our house-made Mushroom Marsala Sauce & Penne Pasta. Oven-Braised Pork Shank topped with Italian Marsala Demi-Glace, served with Creamy Parmesan Risotto and choice of vegetable. Slow-Braised Lamb Hind-Shank topped with Rosemary Demi-Glace served with Creamy Parmesan Risotto and choice of vegetable. Our classic Meat Lasagna served with Garlic Bread. Sautéed Shrimp and Sea Scallops in creamy Alfredo Sauce tossed over Fettucine. House-made Stew of Mussels, Clams, Shrimp, Scallops & Haddock in a Spicy Red Clam Sauce served with a side of Angel Hair Marinara. Claw, Knuckle, and Leg Maine Lobster sautéed in our house-made Scampi-Pomodoro sauce with Spinach Tagliatelle Pasta. The Following Items are Served with Potato or Risotto and Choice of Vegetable. Sea Scallops, Shrimp, Salmon and Haddock en casserole with a Garlic Butter Cream Sauce, topped with Ritz Cracker Crumbs, and baked. 10oz New York Sirloin, grilled to temp, then finished with house-made Garlic Butter. Boneless Duck Breast oven roasted to Medium, then sliced atop a Raspberry Puree with Coffin Cellars Raspberry Wine & Dijon Mustard. Half pound of Sea Scallops en casserole with Garlic Butter & White Wine, topped with Ritz Cracker Crumbs, and baked. 8oz Fresh Haddock topped with Lemon, Butter and Breadcrumbs and baked. Sushi-Grade Tuna Steak Dry-Rubbed then flash-seared to Rare, with Soy Wasabi Butter. 12oz. house roasted Prime Rib, served to temp, with potato or risotto and choice of vegetable. © 2019 Ciao PastA. All Rights Reserved.